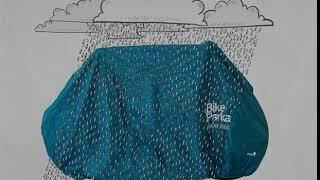 Introducing the handy Bikeparka Urban Cycle Cover, designed for those cyclists that are always on the move. With a dose of style and engineered for tough protection against the lashing rain, snow and even ice, it can withstand the toughest of weather! The Bikeparka Urban Cycle Cover will keep your bike, snug dry and clean, giving it the best essential protection you could ask for. It features unique Vecro lock-through panels, so your lock can be pushed through to secure the cover to your bike. This also keeps the cover down low rather than riding above the lock. Including a handy, tough Stuff Sac that you can easily fit in your bag and can even attach to your bike frame. You can even stuff your BikeParka away when wet, it won’t damage, perfect for daily use. Open - To fit BikeParka to your bicycle, simply put the cover under the front wheel and pull it back over your bike. You can then adjust the toggle on top to take up extra slack left or right. * Cleaning: Sponge clean with warm water and a natural soap/ mild detergent. And don’t machine wash or tumble dry.